The Raiders travel to Cincinnati to play the Bengals at 10 a.m. Sunday. Here’s a breakdown by position. The Bengals will send out Jeff Driskel for his third career start. Andy Dalton injured his thumb in Week 12 and is out for the season. Driskel went 18 of 27 for 170 yards and one touchdown in last week’s loss to the Los Angeles Chargers. Derek Carr continues to improve as he becomes more familiar with Jon Gruden’s system. In the Raiders’ upset of the Steelers last Sunday, Carr threw for 322 yards and two touchdowns. 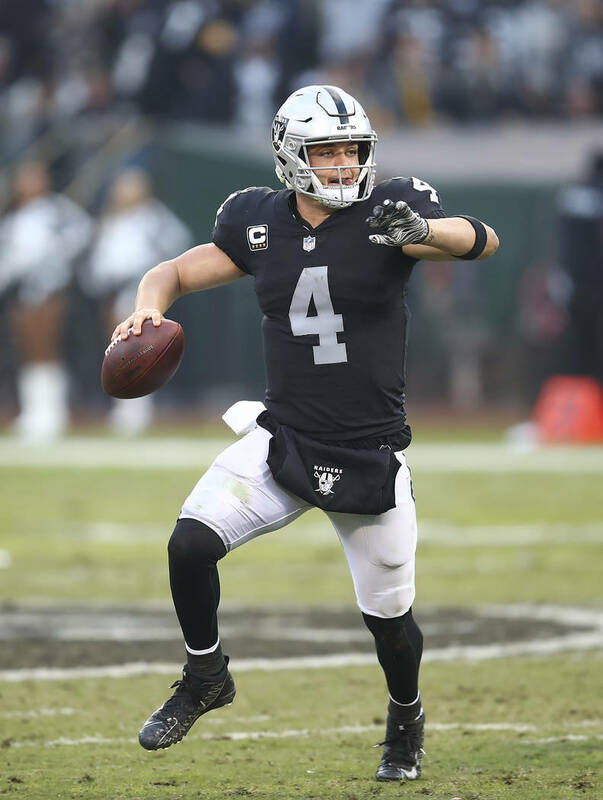 He broke the Raiders’ franchise record with eight consecutive games without throwing an interception — a record held by Rich Gannon since 2001. Cincinnati’s Joe Mixon has blossomed into a solid starting running back in his second season. He is fifth in the NFL in rushing yards per game (78.7) and has run for six touchdowns in 10 games. Doug Martin and Jalen Richard struggled to get anything going against the Steelers’ run defense, combining for 56 yards on 24 carries. A.J. Green is finished for the season after undergoing surgery on his thumb. 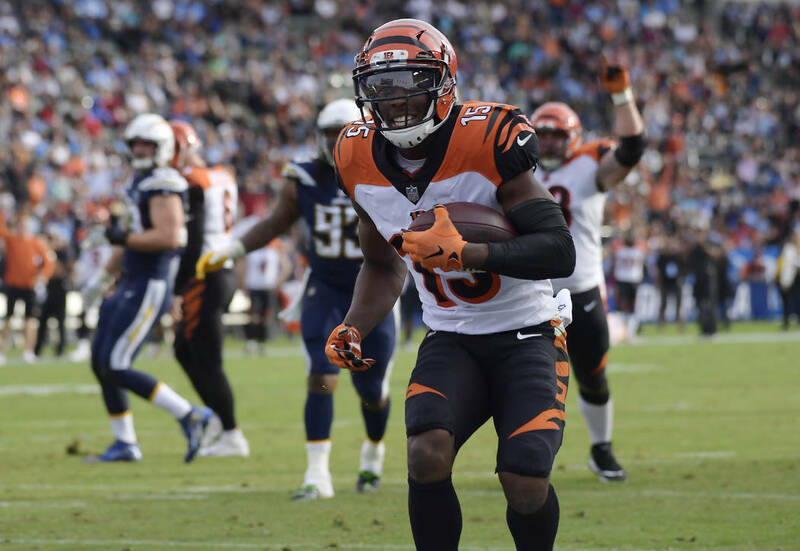 John Ross and Tyler Boyd will be factors for the Bengals, as they have caught six touchdowns apiece. The Raiders’ air attack continues to go through tight end Jared Cook. He leads the team in all receiving categories and had his fourth 100-yard receiving game of the season against Pittsburgh. The Bengals’ offensive line has been inconsistent in the past month. After allowing a combined two sacks against the Baltimore Ravens and Cleveland Browns, they’ve allowed seven in the past two weeks against the Broncos and Chargers. The Raiders’ offensive line is limping to the finish line. The Raiders suffered two key injuries to their line against the Steelers. Guards Kelechi Osemele and Gabe Jackson didn’t practice all week and aren’t expected to play. Both of Cincinnati’s sack leaders are on the defensive line. End Carlos Dunlap has eight sacks, the seventh time in his career in which he has had 7½ sacks or more in a season. Tackle Geno Atkins has sacked the quarterback seven times but hasn’t had one in three games. The Raiders’ defensive line is expecting their sack leader, Maurice Hurst, to return after missing last week. Neither team can stop the run. The Bengals and Raiders have the NFL’s worst run defenses, with Cincinnati last. The Bengals have allowed at least 100 yards rushing in each of the past three games. It could be another long week for Cincinnati with All-Pro linebacker Vontaze Burfict’s availability remaining uncertain. 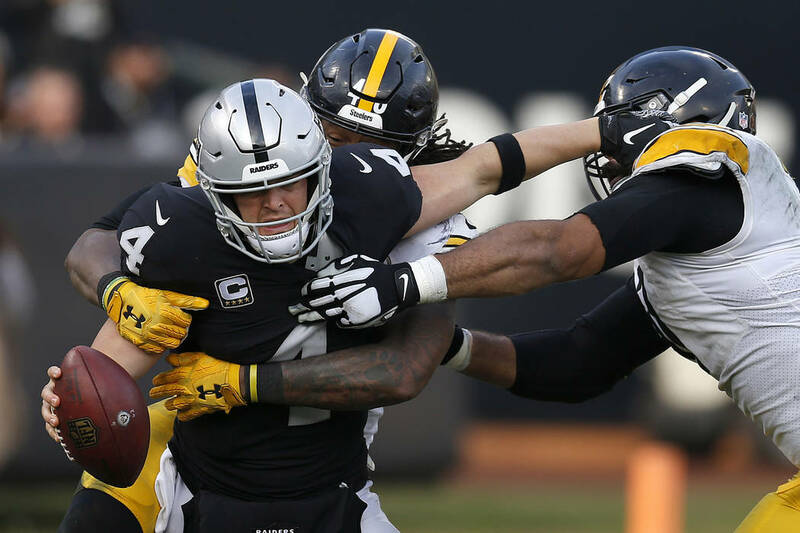 Despite the Raiders’ poor run defense ranking, they did have one of their best performances this season in holding Pittsburgh to 55 yards on the ground. Tahir Whitehead had 10 tackles and an interception. In their past five games, the Bengals have allowed an average of 201 yards passing. But they’ve had trouble forcing turnovers, as their defensive backs have recorded one interception during those games. Raiders cornerback Gareon Conley had a statement game against the Steelers. He was the primary defender for Antonio Brown, who had five catches for 35 yards. Conley also was responsible for a pass breakup that resulted in an interception. Bengals kicker Randy Bullock has been accurate inside the 50. He has hit 12 of 13 field goals inside the 50 but is 1 of 4 at 50 yards or more. Daniel Carlson has made 10 of 11 field goals for Oakland. A confident Raiders squad is traveling to Cincinnati to play a scuffling Bengals team. The Raiders are coming off their biggest victory of the season, and the Bengals have lost five consecutive games. Both teams are out of playoff contention.